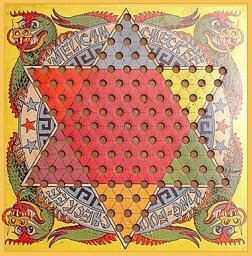 Hop Ching Checkers, published in 1928 by Pressman, marked the debut of Chinese Checkers in the United States. 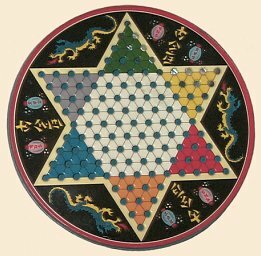 Ravensburger, the famed German game company was the first to modify the square Halma board into the six-pointed star so well known to all who have ever played the game. Ravensburger to this day still calls the game Halma. 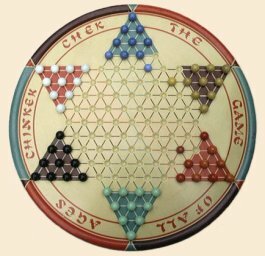 Chinese Checkers, a game for two to six players, may very well be the only true modern classic. The first illustration is of the Straits Mfg. Co. 1938 edition. J & L Randall Ltd.
L. G. Ballard Mfg. 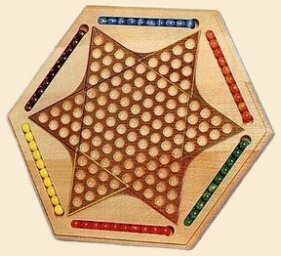 Co.
Chinese Checkers is a game for 2 - 6 players. 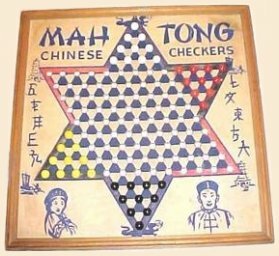 The object of Chinese Checkers is to move your marbles across the board to the star point directly opposite your starting star point. 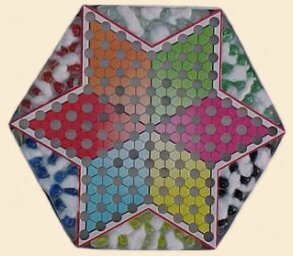 Each player uses a different colored set of marbles and places them into the holes in one point of the star. The players may move or jump in any direction as long as they follow the lines. The marbles may move one hole or jump one marble of any color in any direction, provided the hole beyond the jumped marble is vacant. Multiple jumps are allowed wherever they can be made following the rules. Play continues to the left. 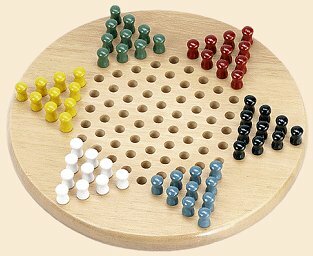 If one or more of a player's marbles are imprisoned in his/her original starting point so that the marbles cannot be moved, such player forfeits the game. 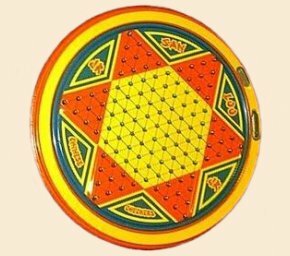 In the event of multiple players, the imprisoned marbles are removed and the game continues as before.